Work has been taking me all over the country. This time it was Dallas. 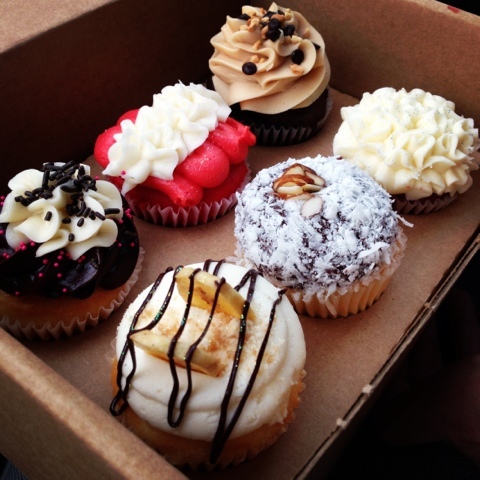 The cupcake shop I wanted to visit most was Society Bakery, but sadly their hours didn't allow me to visit. 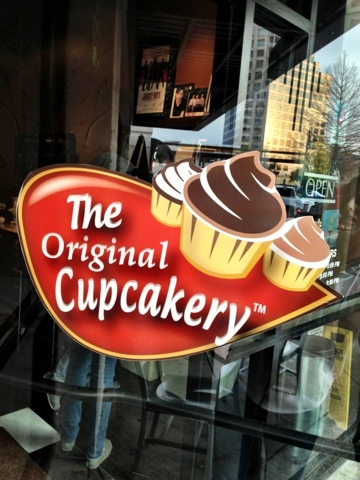 Luckily there was more than one cupcake shop in Dallas. The Original Cupcakery satisfied our cupcake needs while in Dallas. It's located in Uptown Plaza, next to Smashburger. And if we had gotten there 10 minutes earlier, we would have met Toby McGuire. Can you believe that?! Just barely missed him! The Original Cupcakery had a good selection of cupcakes, with lots of unique flavors. They also had wine and champagne to pair with the cupcakes. We picked seven fun flavors & milk and we carted our goods back to the hotel for devouring. Mound of Joy: the candy bar is delicious, so why wouldn't the cupcake version be too? Great combo of flavors. Chocolate Peanut Butter Cup: I'm always happy to have chocolate and peanut butter together and this cupcake was pretty good. I thoroughly enjoyed the peanut butter frosting, but the cake was dry. Butterbeer: my least favorite cupcake of the night. I knew I wasn't going to like this one even before I tried it. The frosting just didn't do it for me. I wish it had been heavier and had a stronger butterscotch taste. Strawberry Shortcake: the strawberry flavor was delicious and I loved the two frostings paired together (strawberry and heavy cream). Kir Royale (raspberry cake with bubbly champagne frosting): this was our favorite cupcake of the night! The champagne smell was strong and made for a great frosting flavor! I loved that it was paired with raspberry instead of the usually strawberry flavor. Banana Bomb: this was a special cupcake for the day. It was my second favorite one. The addition of the banana crisps on top made this cupcake a winner. Oh, My Gosh-Ganache! : the best part was easily the chocolate truffle filling. I ended up digging out the filling and eating alone. The vanilla cake was a bit boring. Overall The Original Cupcakery was pretty good. Although most of the cakes were dry, the frostings made up for the lack of moistness. The abundance of unique flavors really saved them too -- no vanilla vanilla in sight (thank goodness!). We visited the shop near the end of the day and there were still lots of flavors to choose from. The cupcakes cost approximately $3.50 each. 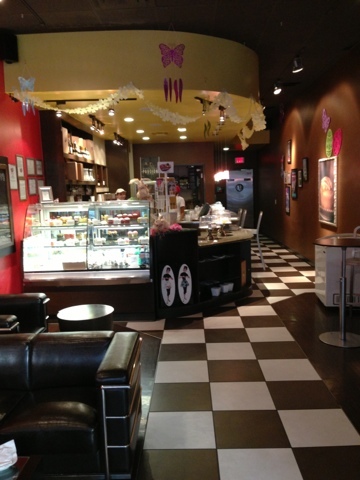 The Original Cupcakery is definitely worth a visit if you're ever in the Dallas area.